HARLEM — Some of the neighborhood's prime real estate stands blighted by construction scaffolding, business owners say, that lingers for years and deters customers. If Aliyyah Baylor didn’t own Make My Cake, a bakery on the corner of 116 th Street and Saint Nicholas Avenue, she would probably avoid the area. 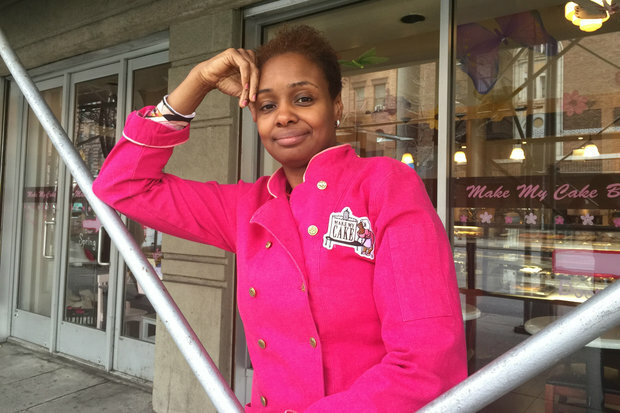 Baylor is not the only Harlem business owner to struggle with long-term scaffolding. At least 14 businesses have had scaffolding hide their windows, doors, and signage for more than a year. The scaffolding in front of the cake shop was installed without warning right outside her business on a Saturday in August 2013. The landlord has renewed he annual permit twice and Baylor has no idea when it will come down, she said. She noticed an immediate decline in sales and foot traffic. At one point, she almost drove past her bakery on her way to work. To help lure customers back, she paid $4,000 for a large banner she hung on the scaffolding, Baylor said. "I couldn't imagine surviving without that signage," she said. Many of the other business sitting under the supposedly temporary structures said they suffer the same problems. “Our sales have gone down by 30 percent,” said Luz Maria Portes, the owner of Tres Hermanas Deli on the corner of 116th Street and Fredrick Douglass Boulevard. The door to her deli is steps away from the door and it is right in the middle of restaurant row, across the street from Harlem Tavern and Streetbird Rotisserie. But ever since the scaffolding came up on October 2011, her deli has lost all of its curb appeal. At first, Portes hung a large banner over the scaffolding. But it was up so long that the rain, snow, and wind destroyed it. Without a sign she can’t advertise the fact that she sells lotto tickets or cooks fresh Hispanic food — plantains, chicken, beans and rice — in the deli, she added. The building’s scaffolding permit, which had been renewed three times, expired in May 2014, records show. Before the scaffolding was installed in October 2011, another shed had been installed from November 2010 to May 2011, according to the Department of Buildings. The building owner did not answer an interview request. Building owners can renew their scaffolding permit as long as they pay a fee and haven’t changed the structure from the approved plans, according the city buildings department. The renewal costs vary depending on the size of the scaffolding. It cost $120 for the first 25 feet and $10 for each additional feet. "A property owner is required to maintain their property in a safe and code compliant manner, a failure to do so will result in violations by the Department and any associated fines," DOB spokesman Alexander Schnell said in an email. "If a property owner chooses to install a sidewalk shed instead of doing remediation on the facade that is the choice of the property owner." Generally speaking, the DOB will only step in and force owners to repair buildings if they thing the damage is so severe the building is in danger of collapse, he added. Of the 15 buildings DNAinfo looked at, four of them have expired permits. Buildings with expired permits receive an $800 fine, according to the DOB. Having to put up with scaffolding is particularly difficult in the spring time. Many restaurants get sidewalk cafe permits to add table seating and visibility during the warm months, she added. “Its heartbreaking when it happens because the business loses everything and it is out of their control,” she said.